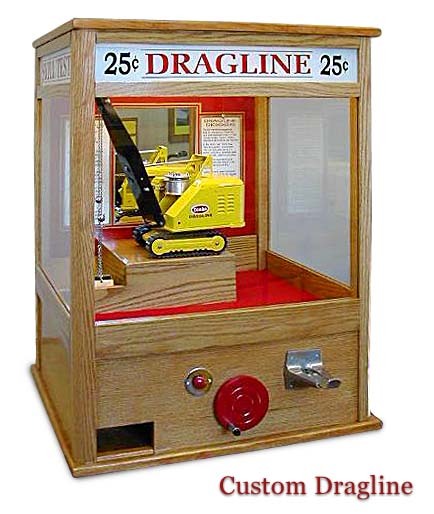 This Dragline Digger was custom built to order for a game room hobbyist, using an original Erie-type mechanism that was completely refurbished. The play method is the “Skill-Stop” system with the stop button to the left of the hand crank. The cabinetry is solid oak wood construction, and finished in Golden Oak with a high gloss final finish. The header signs are painted on the reverse of the glass panels, and back lighted by a florescent fixture. Signs on the cabinet back are “How To Play”, and “The Dragline Digger” (a brief history of the machine).